Yesterday, April 7th, was the big day for Milton! Our goldendoodle is now officially one-year-old! I woke up on the morning of Milt's birthday just a little bit sad that our teeny tiny puppy is now a massive 62-lb. dog. Life flies. Jeff and I were incredibly thrilled to celebrate Milton's birthday (Doodle Palooza!) with some of our closest friends, 24 humans and 13 dogs! We are incredibly lucky to have such wonderful friends who joined us in making Milton's first birthday very special. 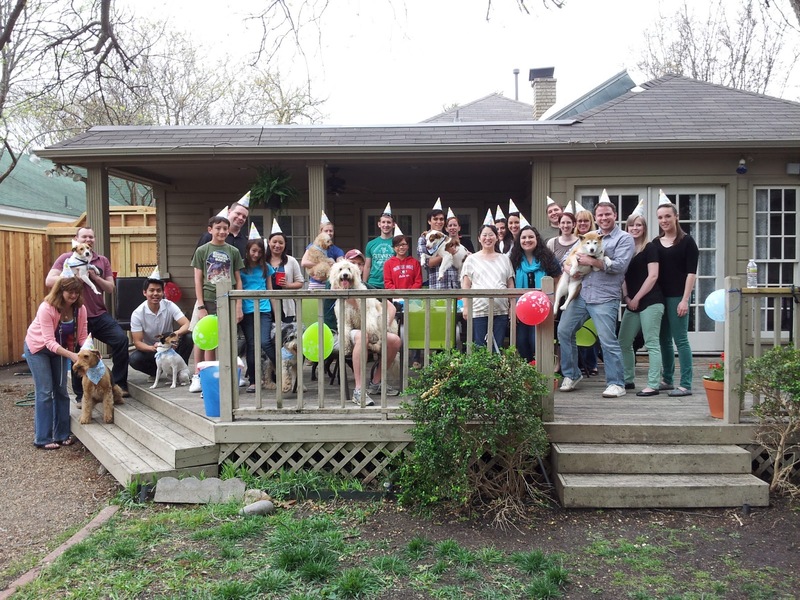 For many, us included, it was our first dog birthday party! I hope to get invited to a few more in upcoming years; it was an awful lot of fun. For all of you out there who are secretly thinking of throwing one of your own, but feel a tad ridiculous, don't. I will personally attest that all party attendees, dogs especially, will have an absolute ball! This week, instead of just writing one giant post about Milton's party, I plan to divide this event up into a post a day to give a how-to on throwing a memorable doggie bash. If you want a paw-ty of your own, make certain to check-in for lots of tips and pointers! On another up note, this was a very special weekend because our friend, Anny, received her double lung transplant! Late Friday evening, Anny received a phone call that a set of lungs was available and that Saturday morning, she was told that the lungs were a good match, and she was to be operated on. The operation lasted six hours, and the doctors were able to place both lungs at the same time. Anny came out of the operation strong with both lungs working! She is doing well now, and she has already greatly lowered her oxygen requirements. I am beyond happy that after 28 years with a set of low-functioning lungs, Anny finally can breath normally, like everyone else! Yes, it was a very, very good weekend. Heidi!! Remi and I thought about you, Jeff and Milton all weekend! I can't wait to see all the fun! I think that we need to trade emails and addresses because Remi wanted to send Milton a gift and couldn't! Look me up on FB??? Milton! Happy Birthday from Remi and our whole family! Know that you were being thought about and loved many miles away!!!! Ah! You are sweet! Yes, I will add you on FB tonight. I wish you lived closer! I can't believe my little boy is all grown up! What a lovely weekend! And it's great to know that Anny got her double lung transplant!!! I see Hops hiding back there.....best buds!